Israeli Forces Demolished Al-Araqeeb Village For 120th Time 4 out of 5 based on 4 ratings. 4 user reviews. As reported by Turkish Anadolu news agency, the Israeli military entered the Al-Araqeeb village on the morning of October 25, and bulldozed the Palestinian houses on the claims of them being illegal. Since the first round of destruction in June of 2010, this marks the 120th time the Israeli military demolishes the houses in the village, according to a member of the Al-Araqeeb Defense Committee member. About 87 Bedouin are estimated to live there. The last demolition was approved by Israel on October 3. Israel says that the village is illegal, while the people of the village say they inherited the village from their ancestors. The villagers reconstructed their homes after each demolition. On the other hand, Israeli Prime Minister Benjamin Netanyahu previously approved building plans for 3,736 new units in Jewish settlements in the occupied West Bank on October 9. Even though most nations consider this and continued Israeli occupation of the West Bank in violation of international law, Israel disputes this. If the argument that they inherited the village from their ancestors is valid, then why do the Israelis have less claim to the land as so many of you racist anti Semites loudly proclaim? Because the colonizers don’t have ancestors in Palestine unlike the natives. Read the reference books by Israeli university professor Shlomo Sand. First of all, there is nothing “racist” or “anti-semite” in condemning invasion, colonization and deportation of the native habitants (palestinians) of a country. That you used such words shows only that you are not interested in what is right and true re. this issue. 1. They left the country of Palestine centuries ago. 2. Those who stayed, many converted to Islam later. 3. Of those who settled recently (after WW2) most are Khazars who originates from the Caucasus region / ->Russia -> other countries to whom they emigrated further, they are no semites. The Khazars converted to Judaism around the year 800. – the authentically “Semite” people are the Palestinians, on the opposite the Ashkenazi colons, with their Slavic roots from Khazaria are oppress and dispossess the true Semites (Palestinians), so THEY are the real anti-Semites, as well those who support them. See here for a record of the crimes of the fascist pigs against peace, crimes against humanity and war crimes. 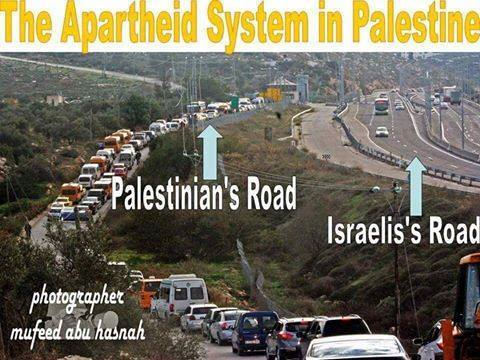 Palestinians illegally driving on an illegally selfmade terrorist road. (sarcasm alert).